Wow. That last little rant on top end pro bike pricing went pretty viral. Flahute's building me up to add fuel to the fire with addtional commentary to come. But for now, something completely different! Many may not remember that the Directeur Sportif for Leopard Trek this year (and with Riis at Saxo Bank in prior years), Denmark's Kim Andersen was quite the monster back in the day. Here's a look back to the year he was at his peak of his powers: 1984. That April, he soloed to win the Fleche Wallonne, after pulling along a nine man early break containing Henk Lubberding of Panasonic and eventual second place finisher Willi Tackaert. Andersen left them all, and authored a long solo to a four minute victory. 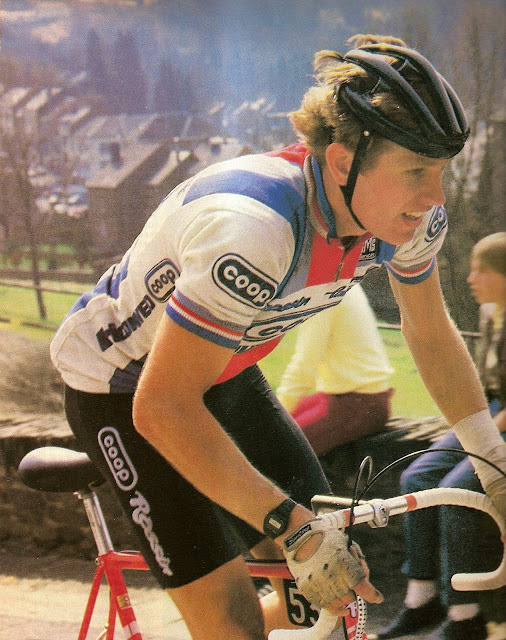 The quinessential rouleur, Andersen was a master of the long solo escape. Will the real one percent please stand up: How much should your bike cost? Read with some amusement the other day that article about the advent of the $10,000+ road bike. 'Halo bikes' they call them. Halo Bikes. Hallelujah, let the pigeons loose. Ten to twelve grand for a race bike? Utterly ridiculous. On oh, so many levels. It got me shaking my thick-mick head, and thinking longingly back to the good ol' days. The mid '70's, when road racing bicycles were all hand brazed, lugged steel tubing. Your wheel choice? Pick 28, 32 or 36 spokes. Grouppo? Either Campagnolo Nuovo Record, Super Record or maybe Shimano DuraAce. There were a lot of bicycle company 'brands' (e.g. frame designers, brazers and assemblers), but the basic ingredients were all about the same really. Funny thing was, guys still rode 30 mph on them, no problem. In fact, I think they could handle them a heckuva lot better in a peloton too.